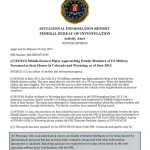 In May 2015, the wife of a US military member was approached in front of her home by two Middle-Eastern males. The men stated that she was the wife of a US interrogator. When she denied their claims, the men laughed. The two men left the area in a dark-colored, four-door sedan with two other Middle-Eastern males in the vehicle. The woman had observed the vehicle in the neighborhood on previous occasions. 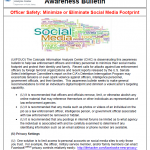 The Colorado Information Analysis Center (CIAC) is disseminating this awareness bulletin to help law enforcement officers and military personnel to minimize their social media footprint and protect their identity and family. Recent calls for attacks against law enforcement officers by foreign terrorist organizations and recent reports released by the U.S. Senate Select Intelligence Committee’s report on the CIA’s Detention Interrogation Program may exacerbate tensions or even spark violence against officers, intelligence personnel, government officials, and their families. This awareness bulletin seeks to make general recommendations to limit an individual’s digital footprint and diminish a violent actor’s targeting capability. 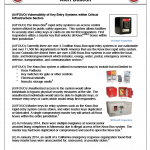 The Knox-Box® rapid entry system is an access control system utilized by public safety agencies. This system allows facilities to securely store entry keys or cards on site for first responders. First responders utilize a master key that unlocks all Knox boxes within their jurisdiction. Currently there are over 3.5 million Knox-Box rapid entry systems in use nationwide and over 11,500 fire departments in North America that use the Knox-Box rapid entry system. In one Colorado fire district there are over 4,000 Knox-Box systems in use within the local, state, and federal government which includes; energy, water, postal, emergency services, defense, transportation, and communication sectors. Unauthorized access to the system would allow individuals to bypass physical security measures at the site. The unauthorized individuals would also be able to duplicate keys, or remove entry keys or cards which would delay first responders. The State of Colorado legalized medical marijuana in 2012 and recreational marijuana in 2014. There has been an increased amount of marijuana infused products sold to the public. The products range from fruit chewz, gummiez, cupcakes, truffles, rice krispy treats, butter, and banana bread. 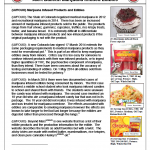 It is extremely difficult to differentiate between marijuana infused products and non-infused products if the original packaging is not with the product. 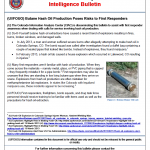 The Colorado Information Analysis Center (CIAC) is disseminating this bulletin to assist with first responder awareness when dealing with calls for service involving hash oil production. James Eagan Holmes, a 24-year-old male, allegedly shot and killed12 people and wounded approximately 38 more after opening fire in a crowded movie theater during a showing of the new Batman movie, “The Dark Knight Rises.” The shooting erupted during the midnight showing at the multiplex in Aurora, Colorado, not far from Denver, where a large crowd had gathered, some dressed as characters from the highly anticipated Batman sequel. Holmes began the attack by throwing two gas canisters into the theater after entering through an exit door that had been propped open. Witnesses stated many assumed it was a promotional stunt related to the movie and did not initially react. After both canisters had deployed, Holmes commenced shooting into the crowd. Al-Qaida in the Arabian Peninsula (AQAP) has released issue 9 of its English-language “Inspire” Magazine. There is a portion of the magazine dedicated to attacking the United States by starting wildfires. The article instructs the audience to look for two necessary factors for a successful wildfire, which are dryness and high winds to help spread the fire. Specific fire conditions that are likely to spread fire quickly are Pinewood, crownfires (where the trees and branches are close together), and steep slope fires (fire spreads faster going up a slope). The Colorado Information Analysis Center (CIAC) has no current information indicating an imminent threat to Colorado chemical sector critical infrastructure. However, both within the United States and abroad, recent attempts to perpetrate attacks utilizing the Postal and Shipping and Transportation Sectors has created a need for heightened awareness. The CIAC has produced this assessment to provide situational awareness on the current critical infrastructure threat environment, sector incidents and trends, as well as pertinent updates. Information contained in this report originates from CIAC cases, unclassified local, state, and federal databases, and open source reporting. On 29 October the Colorado Information Analysis Center received notification from Tri-County Health Department regarding several instances of an individual posing as a health inspector. An individual posing as a “Health Department” inspector has called businesses in Adams, Arapahoe, Douglas, and Larimer counties to set up a meeting to inspect their facilities. However, once scheduled the individual does not show up. The CIAC is aware of similar incidents in Orange County, CA in June 2010. Although Orange County does not use the 760 area code seen in the above incidents, it is possible that these similar reports indicate a trend that crosses state lines. The “inspectors” in Orange County used the same MO as in the Colorado cases. In other states, these types of imposters have extorted money from food facility operators, although this type of activity has not been reported in Colorado. Smartphones feature an diverse array of computer capabilities which expose them to many of the vulnerabilities previously confined to computers. These threats have evolved from targeting personal computers (PCs) to hitting smartphones much quicker than some security experts anticipated. It took almost fifteen years for these types of attacks to evolve for PCs, but these attacks have been adapted for smartphones much more quickly. The malicious software (malware) currently targeting smartphones attempts to gather personal information stored on the phone and sell it. Since users often store more of this type of information on smartphones than PCs, in some cases it has become more profitable for hackers to create malware for smartphones than PCs. Terrorist operations are most likely to be disrupted during the extensive planning phase. You can help prevent terrorism and other types of crime by watching for these signs of terrorism. The purpose of the Multiyear Training and Exercise Plan (TEP) is to provide a follow-on companion document to the Colorado Homeland Security Strategy and the priorities set by the State Improvement Planning Workshop. It is a living document that will be updated and refined annually. The Multiyear TEP provides a roadmap for Colorado to follow in accomplishing the priorities described in the Homeland Security Strategy through effective trainings and exercises. • Enforce all the laws of the State of Colorado. • Direct, control and regulate motor vehicle traffic on public roadways. • Inspect vehicles for safety-related equipment violations. • Provide community education and administer safety programs to the public. • Perform criminal interdiction on Colorado highways, focusing on the transport of illegal drugs. • Assist in state homeland security efforts. This Exercise Plan (EXPLAN) is designed to aid exercise planners in the design and implementation of an effective exercise. An EXPLAN also enables exercise participants to understand their roles and responsibilities in exercise planning, execution, and evaluation. This EXPLAN was produced by the Colorado Department of Public Health and Environment (CDPHE) Emergency Preparedness and Response Division (EPRD) with input, advice, and assistance from public health regional staff in all nine of the Colorado All-Hazards Emergency Management Regions.